Happy New Year, everyone! We hope you’ve been enjoying being home for the holidays. However, classes at Hogwarts are starting back up soon. Beginning January 3rd, Sixth Years will be able to enroll in their courses for the year! As you can see in the schedule linked below, all your old favorites are continuing, alongside the revival of some forgotten gems like Magical Literature and Magical Art. Come explore the magic that HiH has to offer in its second-to-last year! You can find a schedule here for convenient access. Credit and thanks go to Professor Rosenquist for this graphic. 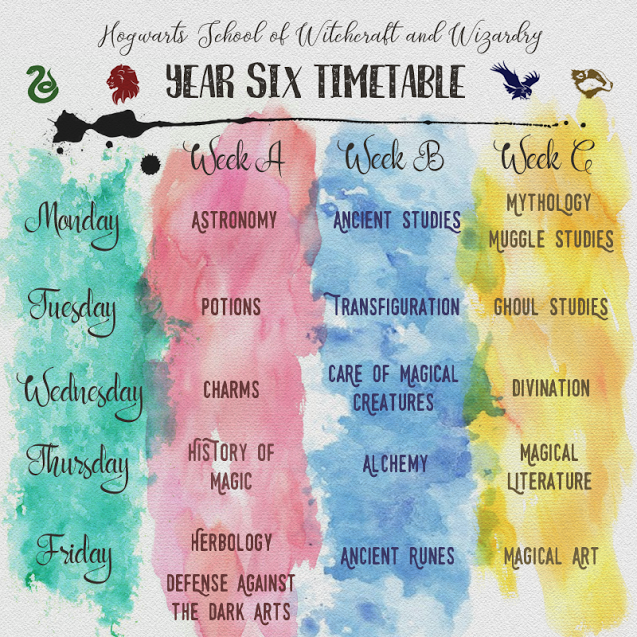 Please note that courses undergoing rewrites -- such as Astronomy, Herbology, and Transfiguration -- will not be posting Sixth Year lessons on their appointed day, but will instead post their revised content.